You can't get away from spending money on food, and it can be time-consuming to plan purchases to save the maximum amount of money. I haven't been as diligent as I should be about groceries -- I used to keep a price book; shop only sales; use coupons religiously. I have gotten sloppy, and our grocery budget reflects it! I decided to get our food budget back under control this fall, and started with my shopping trip last night. I couldn't get a better picture, but this is a shot of my receipt from last night's grocery run. 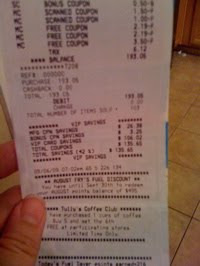 I saved $135.65 between coupons and store specials, and spent $193.06. I purchased 103 items, so it averaged out to about $2/item. I bought only things that we would regularly purchase, and everything that we'll use. I was fortunate that I had a few coupons for free items, which helped bump that figure up. I had a coupon for free bacon - which was worth $4.69 and a free Oscar Mayer Lunchable - which was worth $3.50. It also helped that the store was offering quadruple coupons this weekend (up to $1) and also accepted competitor's coupons. I had a bunch of coupons that were about to expire, so I used them and enjoyed the savings. One thing that I noticed is that stores are definitely starting to limit the brands they offer. I had coupons for Musselman's applesauce, but the store I visited only stocked Mott's and the store brand. That happened with a frozen treat as well -- they only stocked the Dreyer's brand of whole fruit bars. The thing that helped the most was that my sister came shopping with me. She usually does, and it helps because she helps keep Lydia entertained while we shop. If I hadn't her help, there's no way I could have successfully used coupons last night. I feel like I know many of the money-savings tactics for groceries, but the time factor required has overwhelmed me recently. I need at least an hour each week just to plan grocery trips -- reviewing ads, planning meals, reviewing coupons. And then it's always at least 90 minutes in the store. How do YOU find the time to save money at the grocery store? I know the mechanics of saving money (coupons, where to find more coupons, sales, price books, price matching, loss leaders, etc.) Even though I know that, I'm not putting the things I know into practice right now. I'm curious about your strategies and would love to hear from you! you can get grocery coupon online at http://printable-coupon-cmc.blogspot.com/. It really helps me to... 1. Shop at discount grocers (Aldi’s/Save-A-Lot), 2. Shop alone, & 3. Plan my meals for the week.